is painted on a 14" charger. This design tells Bobbie's story about the May Day jester carrying the flower pole to the May Day Queen's party. 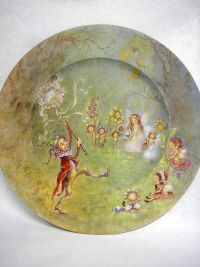 In attendance are the flower fairies and elves.